(12 June 2012, El Dorado Hills, California) First came the studio version, now here is the live version! The DVD and 2CD set includes the complete album, Erik Norlander - The Galactic Collective, performed LIVE at The Rites of Spring Festival 2011 along with the “Into the Sunset Suite” and the Norlander-penned Lana Lane songs, “Capture the Sun” and “Secrets of Astrology” creatively woven into medleys to complete the celestial sojourn with guest vocals by none other than Lana Lane herself! 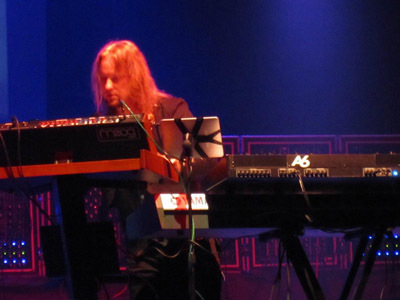 Erik’s Modular Moog synthesizer, “The Wall of Doom,” was used extensively at this concert, and band is introduced with an excellent and informative monologue from Michelle Moog-Koussa, Executive Director of The Bob Moog Foundation and daughter of the late maverick synthesizer pioneer and inventor, Robert Moog. 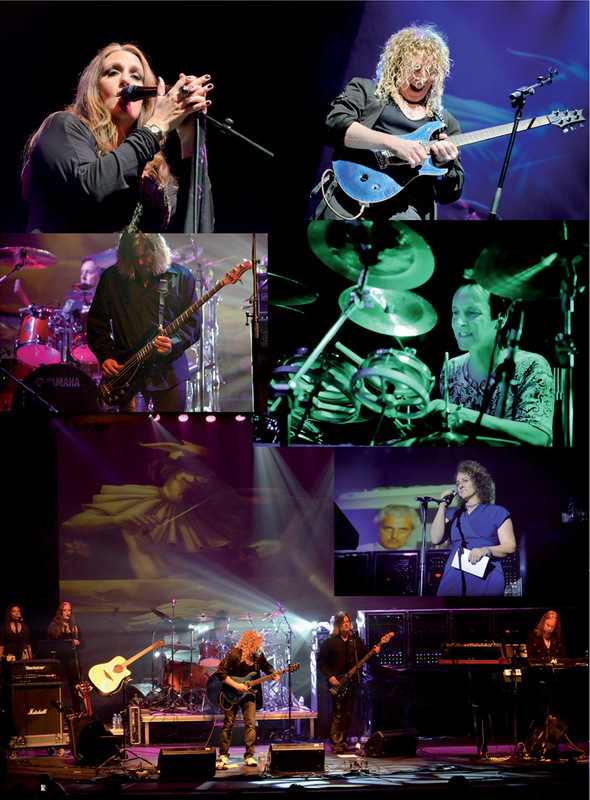 Full color, detailed booklet includes not only beautiful photos from the concert but also liner notes by Erik's synth tech, former Moog Music designer and ELP keyboard tech, August Worley, along with an additional article written by Erik himself especially for this release. 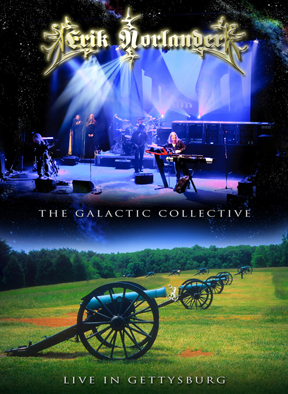 LIVE IN GETTYSBURG is the inevitable companion to its partner release, THE GALACTIC COLLECTIVE - DEFINITIVE EDITION, that contains the complete studio recordings along with extensive video interviews. They can be very intimidating – a wall of stoic black faces of individual panels punctuated by silver knobs and connectors. But to the initiated, a modular Moog synthesizer is a treasure trove of undiscovered sounds limited only by your imagination … well, that and the number of patch cords you happen to have! I grew up in a small suburb of Buffalo, New York, and as a kid interested in electronics in high school; my first awareness of this new way of making sound WAS these iconic beasts. I can recall laying on the carpet in the family dining room listening to synthesizer records and pouring through product brochures for Moog modules, trying to understand what the different controls did. I would listen to records made by the progressive rock giants of the ‘70s as they used this technology to create amazing sound textures with stunning effectiveness. Even today, with over 30 years of experience working with synthesizers at every level, if I hear the words “Moog Synthesizer” – a modular Moog system is what I instinctively think of. Looking back now, it seems a thing of destiny that my family and I lived less than two miles down the road from Moog Music’s Walden Avenue plant. Being young and not very geographically astute, I had an odd belief that the folks that made these wonderful instruments MUST have to be located “someplace else.” But in 1980, as I was getting close to graduating with my first degree in electronics, my lab partner casually mentioned in class that he had a friend that worked at Moog Music, and that his friend had told him that they were hiring electronics technicians. It’s only a ten-minute drive – would I like to go down there with him to apply for a job?! Flashing forward twenty-two years, (including several stints supporting Keith Emerson’s rig for ELP tours in the late ‘90s), I found myself in Asheville, North Carolina working as Bob Moog’s principal engineer as we set about developing the last synthesizer he created before his passing, the MiniMoog Voyager. Working on compact synthesizers such as Voyager and other versions of various portable Moog instruments through the years hasn’t diminished my admiration of that particular type of synthesizer, but it certainly has greatly increased my appreciation of just how special the modular systems really are. Aside from the “open architecture” of the instrument, there is a unique character to the sonic purity of the great beasts that is unequaled in any of their more portable brethren. Now, I can go into numerous technical reasons for this, (the use of discrete transistors, device biasing techniques, etc. ), but the fact remains that there is a depth and presence to the sound of these systems that is unparalleled. Compared to a modular Moog, other synthesizers – yes, even Voyager – sound like there are pillows in front of the speakers. Since its inception in 2006, I have been a regular volunteer and Technical Advisor for the Bob Moog Foundation, so it was “right up my street” to accept the challenge in May of 2010 to spearhead the effort by the organization to re-configure Erik Norlander’s “Wall of Doom” (or lovingly, WoD) synthesizer, with the goal of making the instrument “mobile” (well … as mobile as you can make a half-ton of synthesizer hardware spread out over six road cases!). The system previously existed in Erik’s studio as a wall-sized modular Moog which we would break out into 6 discrete, wheeled road cases. A modular Moog synthesizer is like a thoroughbred racing horse – if you expect it to run well, you have to be very particular as to what you feed it! In the reconfiguration effort, one of the most critical aspects to ensuring that a synthesizer built in the ‘60s will perform properly in a live performance setting is to provide it with adequate, clean power. A Moog modular synthesizer is fundamentally a voltage-controlled system, and having a rock-stable power supply is an essential element to their stability. This particular modular Moog is a heavily-customized instrument, and features a massive linear power supply which was custom-built for Erik by Kevin Lightner in 1996. This ensures the sensitive complement of 22 voltage-controlled oscillators, 7 voltage-controlled filters, and 7 voltage-controlled amplifiers run as stable as possible. Further customization of the instrument was added by Julie Yarbrough in the form of 3 custom matrix mixers using Bob’s original mixer design and includes a square wave sub-oscillator circuit for each mixer channel. This gives the “bottom-end” even MORE bottom-end! Visual stimulation is provided for the instrument by 3 LED array panels which Julie also designed and built. Working with Moog Music’s Amos Gaynes, we moved the individual modules that were sent to us from Erik’s studio in California into the road cases waiting here in North Carolina. It then took a tremendous amount of rewiring within each of the enclosures to provide power to the modules within it. Power connections for each enclosure were brought out to a single bulkhead connector in the back of the cabinet which would then connect to a single cabinet which housed the power supply. This cabinet provided ample power to the more than 50 modules throughout the system. With the system reconfigured and working properly, we moved the rig to Asheville’s premiere music club, The Orange Peel, on May 27th, 2010 as the Bob Moog Foundation presented Moogus Operandi, a benefit concert celebrating what would have been Bob Moog’s 76th birthday, featuring Erik Norlander’s wonderfully rich music and the newly “portable” Wall of Doom! Until that time we had all been so concerned with the concert’s technical and performance aspects, we overlooked one significant detail: what were we going to use as a stand for this expansive beast during the show? The loaded cabinets weighed around 200 lbs. apiece, and for the controls to be accessible, the cabinet bottoms needed to be at least 30” from the stage deck. Conventional X-stands proved to be unstable, and only hours before the show we found ourselves in the bar’s basement desperately searching for anything we could use as a stage riser. Suddenly, the solution was obvious: empty beer kegs! Strong, stable, and at almost the correct height, they were perfect! The perfection was underscored by the fact that Moogus Operandi was timed in conjunction with the release of Asheville Brewing Company’s “Moog Filtered Ale.” This exceptional beer was brewed to commemorate Bob’s exceptional legacy, and was enjoyed by Erik, Michelle Moog-Koussa, and myself as we toasted Bob, the Wall of Doom, the synchronicities, and the success of the event afterwards. Bob would have been SO proud! The beer keg keyboard stand once again made an Asheville appearance with the instrument as Erik Norlander, Amos Gaynes and I hosted a demonstration panel entitled “The Power Of Modular Synthesis” at MoogFest 2010. In this presentation we provided an aural as well as a visual historical context of what a modular synthesizer is capable of. As the mighty beast filled the lecture hall with its glorious richness, we came to the realization that many people have never heard this form of synthesis in anything other than recordings. This setting also revealed an aspect of the modular Moog that I had never really considered before: the system’s incredible value as a teaching tool of how a synthesizer develops its sound, as well as the many different ways that it can be configured. This led to the Bob Moog Foundation in March of 2011 shooting a soon-to-be released educational video on synthesis featuring the Wall of Doom, hosted by Erik Norlander. That brings us to this very special project undertaken by Erik, the video recording of “The Galactic Collective: Live at Gettysburg” as part of the 2011 RoSFest event. As the WoD’s principle curator/babysitter/technician, I oversaw freighting the synthesizer to Akron, Ohio for rehearsals and then transporting it down to Gettysburg (minus the beer kegs!). In a festival situation such as this, the time spent in changeover from one act to the next is critical. To facilitate the changeover, each individual cabinet was pre-patched backstage and then loaded into place onstage at the appropriate time where the cabinets could then be interconnected. All went well through set-up, tuning and sound check, except that shortly before the show began I noticed that the instrument would inexplicably play notes indefinitely once a key was struck – an oddity that eventually corrected itself during the performance. I suspected the system was experiencing “dirty” power from the venue (but didn’t completely rule out the possibility that some of the ghosts of the American Civil War were having a bit of fun!). You may well ask if using a modular Moog synthesizer such as the Wall of Doom in a live situation is worth the logistic and technical challenges of lugging a system like this around. I would offer a one-word answer to that question: “commitment.” I feel it requires a significant level of commitment to one’s art to want to use the best tools available to present that art, regardless of any inherent challenges. There is also a level of commitment to providing a sonically and visually memorable experience to the audience. Erik Norlander has that level of commitment to his work and also to the legacy of modular synthesis in using this powerful instrument to provide a unique sonic experience for his audience. NOTHING else sounds like this! There are very few examples of these emotion-stirring instruments still in use in a live setting, and when played through a good PA system – they can HURT ya! Also, Erik Norlander has a commitment to raising the awareness of the existence of these instruments in a historical and performance context. As a society, I feel we are losing a level of connection to how the music we consume is being created. The musical instruments on our performance stages are increasingly becoming laptop computers loaded with software synths digitally generating the sounds we are listening to. The portability of the Wall of Doom presents the exciting possibilities of exposing a listening public to the amazing power of real-time analogue synthesis in its most immediate form. People NEED to be exposed to this thing! As an educational tool – the Wall of Doom contributes an understanding of how each module develops the sound you are hearing. As a visual tool, it is certainly impressive – but there is also a feeling of “involvement” with building the sound you are hearing. As a performance tool, you can turn a knob and hear the results immediately – there are no intermediaries such as touchscreens, submenus or D-to-A converters to contend with. And as a sonic tool, well … as I said before: NOTHING else sounds like a modular Moog synthesizer! And make no mistake: the Wall of Doom is a DIVA! She is singularly unique, exotic, enigmatic and temperamental – and just as this term is used in its original context to describe a woman of outstanding talent in the world of opera, even when she is not “singing,” she commands the attention of the audience. And similarly, as when working with a diva, the tradeoff is that it can take the entire performance to unprecedented heights to create a once-in-a-lifetime memorable experience! 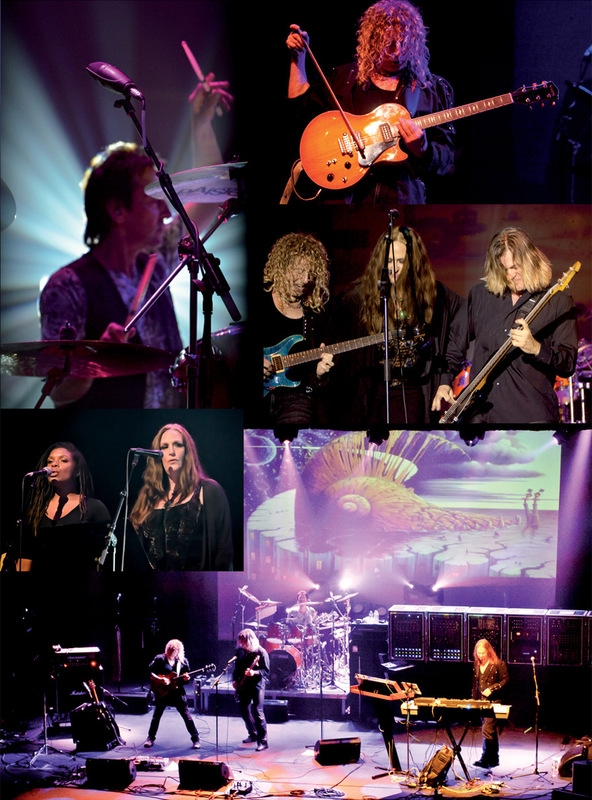 This DVD captures that experience – enjoy! Still photos from the concert and the DVD booklet by Esa Ahola, Robert Wolf and Peter Power - thank you!